A month ago it was fair enough to say that this was one of, if not the hottest, RC autos on the market. How quickly things can change. By no means is the final verdict in, but this card and it's fluctuations in demand and price, serve as a perfect example as to why Rookie card collecting for sheer profit can be such a challenge. Coming off consecutive wins to start the season, Mark Sanchez could do no wrong, The NY Jets new golden boy, a ppeared taylor made for the Big Apple spotlight and Madison Avenue's glitz and glimmer. A look at eBay shows that just in the last 3 weeks this card has fluctuated between $169 for a high and $122.52 for a low. Percentage and dollarwise, that is a huge swing. With 9hrs left, current bidding on another card is at $108.50. With his 5 interceptions against the struggling Buffalo Bills I don't see it going for much higher. I suppose that his potential, USC pedigree and playing in a big market will maintain demand for this collector favorite but with 8 interceptions in 2 games, collectors holding this card should pay close attention to the market, because one more bad game and it might be too late dump before the bottom really drops out. Ok, so that's my thoughts for people already holding the card. So what do you do if you believe things will work out and Sanchez will live up to the early and pre-season hype? Well, as is almost always the case, there will most certainly be opportunities to pick up this card for lower prices than have been realized as of late, particularly if he has another bad game. So do you wait for it to fall below a Benjamin and than hope he and the Jets make the playoffs in the next year or so? Because, then you are in for the long haul. 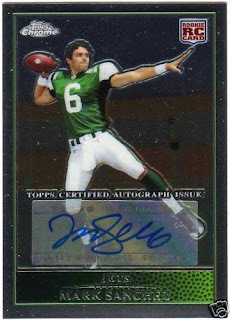 Hey, it's your money, I'm not going to tell you what to do, but, I think it is fair to say that the quick flip of a 2009 Topps Chrome Mark Sanchez RC Auto for a tidy profit are over, unless you pull it from a pack that is.